This is Cecil, just one of the many barn swallows we have here at Morning Bray Farm each spring and summer. He’s sitting on a wind chime hanging on our back patio. The string heading off to the right of the wind chime is a horse or donkey hair trailing from Cecil’s nest. To simplify matters, we call all of our barn swallows Cecil. When the babies come, we’ll be calling them Sons of Cecil, just like we do every other year. The killing of barn swallows for their feathers was one of the issues that led to the founding of the Audubon Society and the passage of the Migratory Bird Treaty Act. A group of barn swallows are known collectively as a “kettle” of swallows. Who wouldn’t agree with #2? Neat picture of Cecil and the wind chimes. I love bird nests that have horse hair in them. I found one at the barn on the ground last year, and had to save it. Just looking at the different horse tail colors in it makes me smile every time. Enjoy your new crop of Cecils! We rejoice in the swallows’ return and mourn when they leave in the fall. We have the ‘barn’ birds and the ‘garage’ birds. The cats duck and run all summer because they are dive-bombed incessantly!! I love your naming convention, but now the pressure is on to come up with something appropriate for the kettle down here. “That’s a fine kettle of swallows” just doesn’t have the same ring, though. I love swallows. Cecil is a very handsome specimen. I’ll bet he’s very popular with the ladies. I didn’t know about the ‘kettles’. 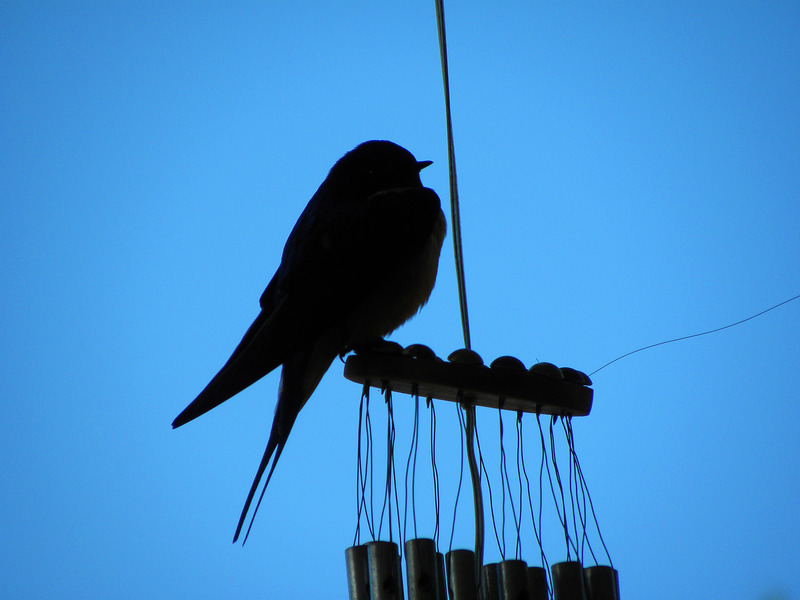 My neighbor has tried everything under the sun to discourage her returning swallows from nesting on her porches. At last count, she had 8 nests. That’s a lot of Cecil poo. 🙂 There’s just something about her porches that they love. I love swallows. I also love your Cecils and think we will follow suit! Must tell my birding friends about this new twist! Wonderful choice for the exposure, great story too. Great photo and story. I always look forward to the bluebirds coming back. We have certain houses that they just love and come back every year. Have a good weekend on the Morning Bray. Heh. You guys crack me up – naming all your swallows “Cecil” is HILARIOUS! Interesting facts – I did not know any of these things. And June cracks me up, too. We call all squirrels around here Buddy. Coincidentallly a local candy/nut shop is known as Buddy Squirrels. Would the people who follow and observe the Cecils be called Cecillians?